The title European Registered Toxicologist (ERT) is accorded by EUROTOX to individuals who have been nominated by their National Register. EUROTOX does not directly register individual toxicologists. 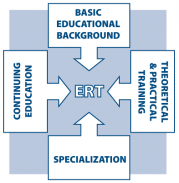 Applications for recognition as ‘ERT’ must be directed to a National Registry. The following table compiles the countries with National Registers that are presently recognised by EUROTOX as setting and maintaining the standard expected for ERT, along with addresses and some criteria. Application details for registration and re-registration are based on Guidelines for Registration, sections A and D, and can be obtained from national registries. Several registries (see table below) admit individuals not adhering to their country’s National Society, EUROTOX individual membes or EUROTOX members without a established local register. Please contact EUROTOX, Registration Sub-Committee Chair Prof. Corrado L. Galli (email: corrado.galli@unimi.it) for advise in identifying an appropriate registry, or a route to eventual registration. Table. Countries with National Registers that are presently recognised by EUROTOX as setting and maintaining the standard expected for ERT, with contact information and some criteria for application.